Thai Pet Industrial Co., Ltd. is delighted to share an official annoucement that we will participate in THAIFEX 2018 - World of Food Asia. The expo will be held at IMPACT Exhibition Center on 29 May 2018 - 2 June 2018 from 10AM - 6.00PM. On this particular event, we will demonstrate how to use our proprietary design technology to help you discover unique package designs and brand identities. In addition, we will share a sample of package designs where various curvatures were calculated to seamlessly match between the bottle and the special-designed cap cover when closed, resulting in a feeling of unibody-liked package. For those who are interested, you are cordially invited to visit us at the Booth Number OO67, Challenger Hall 1, IMPACT Muang Thong Thani. Should you have any inquiries regarding the booth visit, please contact us at 02-445-5776-7 ext. 206. We are looking forward to meeting you at THAIFEX 2018! Thai Pet Industrial Co., Ltd is delighted to announce our second bottle design contest under the topic of "functional drinks". The company representatives will visit various institutions where relevant packaging design programs are available. Because the company believes in creativity and design abilities of Thai talents, the company offers this great opportunity for interested designers to express their state-of-the-art work through the packaging design contest. Among the pacakging designs selected by our contest committees, the company will provide financial awards and certificates of recognition to the best three bottle designers. For those bottle designs that can be developed and implemented further in reality, the designers will be accredited and publicly announced. For more information about the contest, please check out this link (available in Thai language only). Thai Pet Industrial Co., Ltd launched its first bottle design contest at Srinakharinwirot University on Jan 22, 2013 and KMUTT on Jan 24, 2013 to promote the development of creative plastic bottle designs in Thailand. As the company believe in the creativity of Thai designers, the company offers an opportunity for young designers to participate in the plastic packaing development (in a form of bottles) through its bottle design contest. Among the submitted designs, the company will provide awards and certificates of recognition to the best three bottle designers. For those bottle designs that can be developed and implemented further in reality, the designers will be accredited and publicly announced. Based on the massive interest in our products and services at THAIFEX 2012, Thai Pet Industrial Co., Ltd. is honored to invite you to visit us again at PROPAK ASIA 2012, The 20th International Processing, Filling and Packaging Technology Event for Asia, to not only experience the novel and creative design of our packaging products but also learn about the new service offerings. PROPAK ASIA 2012 will be held at Bangkok International Trade & Exhibition Centre (BITEC) during 13-16 Jun 2012 from 10AM - 6.00PM. 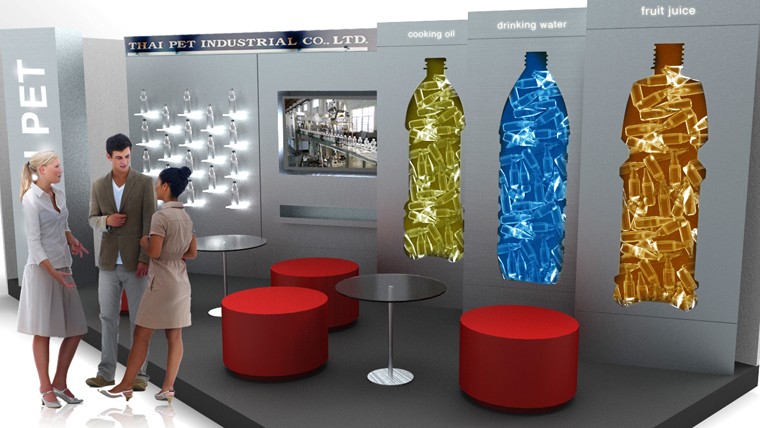 This event will greatly benefit businesses who are looking for a strategic supplier of PET products such as PET bottles and services such as PET bottle design. On this occasion, our company is pleased to share our vision and capacity to reshape your brand identity through creative packaging. You can print out our invitation card along with your business card to get a complimentary gift at our booth (Stand Number BB49 in Hall 105). If you have any questions regarding the booth visit, please contact Miss Piyaporn at 02-445-5776-7 ext. 102. We are looking forward to meeting you at PROPAK ASIA 2012! 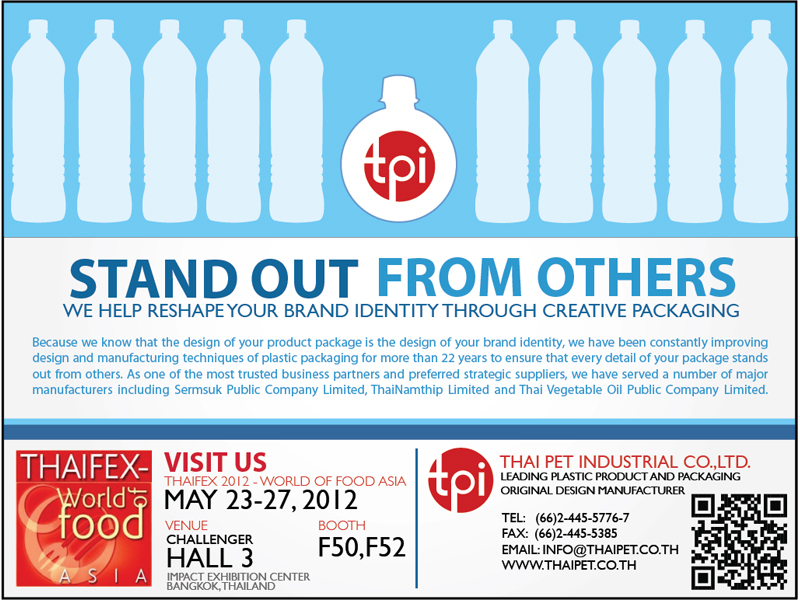 Thai Pet Industrial Co., Ltd. is excited to share an official annoucement that we will participate in THAIFEX 2012 - World of Food Asia, one of the biggest international trade fair on food and beverages as well as beverage packaging technologies and services in Asia.The trade fair will be held at IMPACT Exhibition Center on 23-27 May 2012 from 10AM - 6.00PM. As a leading original design manufacturer of plastic products and packaging, we proudly share not only the novel and creative design of our packaging products but also the new service offerings. On this occasion, we will share our vision and capacity to reshape your brand identity through creative packaging. Since this opportunity will benefit businesses who are interested in products such as PET bottles and services such as PET bottle design, we cordially invite you to visit us at the booth number F50, F52 in Challenger Hall 3. You can print out our invitation card and bring your business card to get a complimentary gift at our booth. Should you have any inquiries regarding the booth visit, please contact Miss Piyaporn at 02-445-5776-7 ext. 102. We are looking forward to meeting you at THAIFEX 2012!